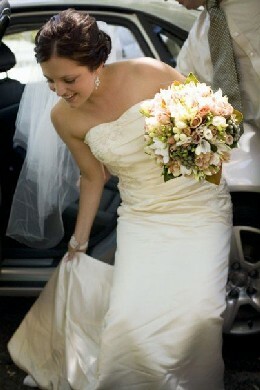 Wired Bridal Bouquet Course – over 4 days or 4 weeks – great practice before a Wedding. Wired Bridal Bouquet Course – Over 4 days or 4 weeks – either 4 days. Classes are held at Wiseman’s Ferry, NSW. This exciting and inspiring fully-wired Bridal Bouquet Course teaches you a variety of bouquets including a Circular, fully-wired Bridal Bouquet of 45-50 roses, a Teardrop Bouquet of roses and another choice of flower, perhaps spray roses, singapore orchids, or freesia; a Circular stemmed Bouquet of mixed flowers for a Bridesmaid and last but certainly not least. a Shower Bouquet which is the ultimate sophistication and suitable for any Bride, all Bouquets are completely finished off with slim handle, which is covered in double-satin matching ribbon. (A Professional finish and ready to go to any Wedding in the next few days – these Bouquets will last a week once each flower is fully-wired and some will last much longer, such as Orchids and Native Bouquets. We are delighted to offer this wonderful “Wired Bridal Bouquet Course” – 4 days over 2 weeks or 4 days over 4 weeks. This is an amazing opportunity for Florists, who have never been able to learn enough in practical design or fully wired bouquets during their years in a shop and will give them the confidence to branch out into this specialized field and to have the ability to be able to offer their Brides more than the common stemmed bouquet of which may be suitable for Bridesmaid’s, however, not up to the professional quality and standard required for the Bride to display with her beautiful lace, beaded, or sequined, delicate and extravagant Bridal Gown. The difference is this: a fully wired Bridal Bouquet will not catch or damage a lace, beaded or delicate fabric gown; all photographs will view the entire shape of the bouquet and see every flower (i.e. half the bouquet is not hidden because it does not hold closely to the Bride – see picture right,) flowers will not break off, or fall out at any time or under any circumstance; the Bride sometimes may drop her Bouquet (from being knocked, or it may simply slip out of her hand or, on passing to someone, it accidentally ends up on the floor) your fully-wired bouquet will not bend or break and will remain in place for the duration of the Wedding. However, the next day it may show signs of bruising, as flowers suffer shock when they land on their faces with impact; also petals may be creased somewhat, however, they will have made it through the entire day without a problem and this is why it is so important for the Bridal Bouquet to be fully wired and flowers not attached to their stem, of which bends and breaks so easily, (never lower your standards by accepting a plastic “bridie” as they are called) these are the most inferior quality of all bouquets, the fresh flowers are in an ice-cream type plastic/oasis handle and some florists actually glue them in; an example of a cheap, tacky, unprofessional florist who does a ‘quick’ job; don’t be one of these and enrol to learn the correct way to present a Bridal or Bridesmaid Bouquet to your client with pride. Stemmed bouquets may have a support-wire wrapped around the stem and up through the base of the flower, this damages easily when dropped and the head of the flower/rose may still fall off and go flying down the aisle or somewhere; extremely embarrassing for the Bride. Be trained as a Professional Florist and enrol now in our next Wired Bridal Bouquet Course – this is an extremely informative and valuable course to the most experienced Wedding Specialist, we offer simplified teaching methods of which streamline the entire process and show you how to make the perfect handle and lightweight bouquet. As Steve Job quotes, “simplicity is the ultimate sophistication” and this definitely applies to our Wired Bridal Bouquets. Join us now, all qualified Florists and Teachers are welcome, we accept all ages too! Classes – your choice of days – please call to check availability. Priced @ $1,980 is all inclusive: personal/private tuition in a class of max. 4 students all flowers, wires, parafilm, ribbons, etc. These courses are available most of the year, Class times are 11 a.m. to 3 p.m. We also have 1 and 2 day Bouquet Workshops on special @ $980. Please call the Academy of Floral Art for the next available dates. Accommodation is available at discounted rates and in some cases included – ask about our packages.